Natalie Young and Paul Gorton's love story. A shared easy-going nature and dedication to family and friends created an instant connection between Natalie Young and Paul Gorton when they met at a Brisbane pub in August 2016. Paul, an MRI specialist who lived on the Gold Coast, was up for work in Brisbane when he met Natalie, a teacher. They instantly hit it off and began taking turns travelling between their respective cities to go on dates. The couple decided to move in together in Coolum so they could be closer to the ocean and have more opportunities to enjoy the great outdoors together. Natalie says they have a shared passion for any form of game and competition and would turn a leisurely mountain hike into a race once the end of the track approached. They would also never miss an opportunity to wager a bet with one another. In keeping with this, Paul proposed to Natalie in September 2017 with an elaborate treasure hunt with 15 clues at the private Mount Tamborine cottage they had stayed at a year beforehand. “I was off the scent and had no idea and just thought it was kind of like an excuse to go back there because we both loved it,” Natalie says. “He had me travelling all over the property looking for clues and the 15th clue was a bottle of my favourite Veuve in front of the fire. I thought it was a sweet anniversary gift. The decks were marked ‘Yes’ and ‘No’ and despite being in shock at what was happening, Natalie went straight for the Yes deck. “It said ‘HOORAY! You chose the YES card! You have made the best decision of your life and have made me the happiest man on the planet. I love you to the moon and back and I can’t wait to spend the rest of my life with you. Now, where is that champagne?!? !’,” Natalie recalls. Natalie says they were so excited to get married that they simply didn’t want to wait, so they set the date for April 21, 2018. “We didn’t need anything extravagant. For us, it was more about getting friends and family together to celebrate,” she says. The majority of their wedding plans came together seamlessly (Natalie even found the perfect dress on the first go) but with 120 guests and a short lead time, Natalie says they had come up against a few challenges in securing a venue. That was until they came across Pier 33. The venue had only just opened up to host functions and Natalie says the instant she walked through the door, she knew they had found the place. “My dad used to spend a lot of time there with his surfing team when it was the old yacht club, so I thought it was perfect,” she adds. 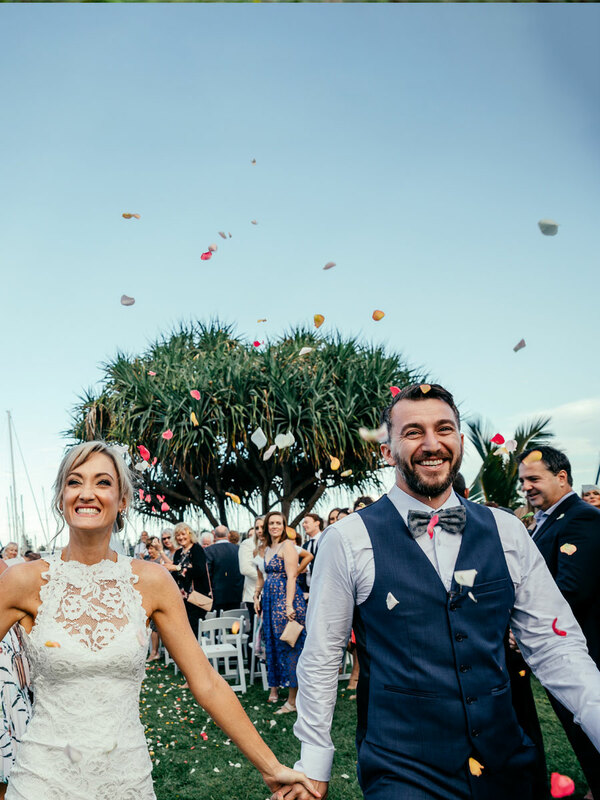 The couple chose to have their ceremony at the Mooloolaba Marina, which is within walking distance of Pier 33. When 4pm arrived on the big day, Natalie was flanked by seven bridesmaids all dressed in white and carrying bunches of baby’s-breath. She looked radiant in a Grace Loves Lace wedding gown with her great grandmother’s diamond brooch in her hair. The collection of white dresses was offset by the natural surroundings in the park at the Mooloolaba Marina. Paul had five groomsmen, including his best man who flew in from the UK. The men injected a bit of colour with navy pants and vests. Two adorable flower girls and a junior groomsman rounded out the bridal party. While the couple were exchanging the vows they had written themselves, Paul announced that he had brought their beloved dog, Xavi, to the ceremony to witness his ‘parents’ getting married. It was a touch that Natalie says was moving and one she will never forget. The couple decided to throw a few traditions out the window for their big day, first by inviting their respective mothers to sign the registry for them. They also decided to forego the usual bridal party photoshoot and instead, stole some time alone with their photographer while their guests moved on to Pier 33 for drinks and canapes overlooking the water. “The day was such a whirlwind, it was so lovely to get that time with Paul to process that we had just got married. It was a beautiful moment on the day for me,” Natalie says. Having not seen the venue decked out before setting foot inside the private function room upstairs at Pier 33, Natalie says she was in awe of how her minimalistic styling of sparse greenery, white roses and candles on the long tables transformed the room. Guests feasted on share plates that were placed along the centre of the tables, creating an intimate family meal atmosphere, and after dessert, they tucked into a truly unique wedding ‘cake’ made from tiers of cheese topped with figs, nuts and dried fruits. The five-piece Millennium Band had guests on their feet until the clock struck midnight, signalling the end of what Natalie called “the most amazing day”. Pier 33 Mooloolaba restaurant, bar and functions venue offers panoramic waterfront views from all aspects of the venue. Overlooking the Mooloolaba Marina, it is styled in a sophisticated nautical theme. This two-storey building is perfect for all weddings and functions. The culinary team brings sustainably and ethically sourced cuisine to the table, sharing this passion and food philosophy to showcase the region’s most unique produce. The venue can comfortably cater for 120 people for sit-down occasions or up to 250 people for a stand-up cocktails in the large, upper-level function space. For smaller events, Pier 33 offers a private dining room for 25 to 60 people.